I have a chalkboard wall in my office, where I recently wrote: Vulnerability breaks the myth, destroys the façade of protection (Pisces Moon). I’ve been thinking a lot about exposure and vulnerability. People seem to operate on a continuum—one end is protection from exposure, the other is risking being seen for who we are. Is it animal instinct that says if I can be seen, I can be attacked? I’m not sure, but it certainly feels that way sometimes. Being protected isn’t much better, though. Something inside dies a little when I keep my authentic self hidden away. Author Brené Brown’s research into living wholeheartedly has shown a correlation between vulnerability and life satisfaction, which she describes this way: “Wholehearted living is about engaging in our lives from a place of worthiness.” I want to risk exposure and live wholeheartedly for lots of reasons. But risk does not happen in a vacuum. I can’t decide one day to simply start risking exposure if it feels like the world around me will go in for the attack. I realize this journey cannot be done alone. I need intimacy and connection to take those risks. I need experiences of acceptance. I think we all do. Each time I go past my edge of comfort I know I am taking a risk. I am being vulnerable. These risks not only allow me to live a life of worthiness, but they break the myths that tell me that I am isolated and irrelevant to others, or that if I am exposed I will be attacked, or that worthiness comes from outward success. There are many myths that can be broken by vulnerability. I am ready to go a little further into this possibility this lunar cycle. Pisces is good at this. Pisces, as the mutable water sign, dissolves and breaks down barriers, and as the last sign in the astrological year, Pisces’ mission is to relinquish the past in preparation for a new cycle. On March 8, the Pisces lunar cycle begins with a Solar Eclipse. Eclipses themselves are signals that the old way of seeing something is passing away. New light will shine. This lunar cycle will be a potent opportunity to break down myths and experience how our journeys of risk and wholeheartedness are connected to everyone else’s. The Pisces season is a time to dive into the collective soup. This is not the time to enforce isolation but to reach out to others and let them reach out to you. The paradox of Pisces is this: as I lose my sense of individual self, I become more myself. We need each other to risk vulnerability. This month will be a potent time to lose and rediscover ourselves over and over. Planets in mutable signs—Sun, Neptune, Chiron, Mercury, Venus (after March 12), Mars, Jupiter, and Saturn—are screaming for our integration and wholeness. And by wholeness, I do not mean perfection. I mean the whole of our hearts and wounds and shadows and doubts. The mutable signs prepare the way for the next turning of the wheel, represented by the cardinal signs that follow. There is work to be done, not only with letting go but also with learning, synthesizing, refining, serving, and discerning. This prepares us for an uncertain future. How do we best make new choices and realize new ways of being? The mutable signs gather the data to help us try. Framed this way, I realize how important it is to break down old myths and allow myself to be seen. This lunar cycle will challenge and support this intention. Will you join me? Monday, March 7. Tomorrow’s solar eclipse beginning to the Pisces lunar cycle kicks into gear today. Might as well flow into the cosmic ooze to get started on the work of the next lunar cycle. Think: dissolution and union, compassion and vulnerability, risks and resiliency. The potential for big experiences is strong, depending on how tuned in you are. The potential to numb out and escape is pretty strong too. Resist thinking about these urges as good/bad, but think of Jupiter in Virgo (about to oppose the Sun tomorrow) as a clarion call to be discerning. What serves you? The morning is a temptation to experience bliss when the Moon conjoins Venus, but by the middle of the day (CST) we may notice annoyance and frustrations when the Moon in Pisces makes a square to Mars in Sagittarius. This may be the needed pinprick to help us wake up to our intentions and desires. Be ready to receive intuition-based messages this evening when the Moon conjoins Mercury. 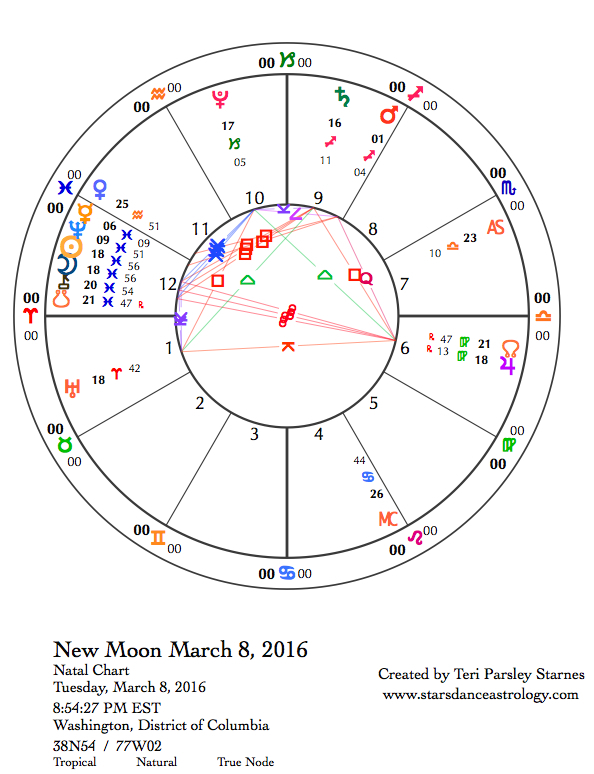 March 8—New Moon: Dreaming. Solar Eclipse. What defenses are you ready to give up? Will you boldly risk vulnerability to crack open a myth that no longer serves your own thriving? 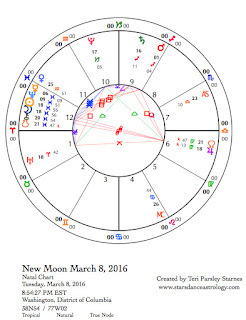 The chart for this New Moon in Pisces is not fooling around, so why should our intentions for this cycle be timid? This ending/beginning time of the year is powerful. Pisces, the sign for this season, has a relationship to the concept of redemption. This is a tricky concept for it leads to the ideas of sin and shame. We can easily forget that we are at all times in sacred space and are sacred beings when we go down the path of needing redemption. However, nature reflects redemption back to us when we see the ending of one cycle of life and the beginning of another. Grace comes from the innate instinct to say we are sorry, to forgive ourselves and others, and to wipe the slate clean so we may begin again. This too, is tricky. Pisces is also tied to escapism, the type of behavior that might want to gloss over the wrongs that have been done and step immediately into redemption before a true accounting is made. What if there is a use for redemption and a way to approach it that affirms and strengthens our accountability? Perhaps we will be given the opportunity to explore that idea this lunar cycle. This New Moon is a Solar Eclipse (and also a Supermoon). When the light goes out of the Sun for a brief moment, it is as if a slate is being wiped clean. A long lineup of planets in Pisces may heighten this sense that we can be redeemed in some way. Mercury and Neptune are conjoined in Pisces emphasizing the messages we receive and send intuitively. The Sun and Moon in Pisces are conjoined Chiron and the South Node of the Moon inviting us to consider the wounds and karma we carry around with us. Perhaps it is time to compost that stuff. The t-square aspect pattern in the chart for this New Moon increases the pressure to get things right or to give up completely. Notice when you feel that things have to be good/bad, black/white, right/wrong. This is a sign to step outside the pressures of the opposition to Jupiter in perfection-loving Virgo and the squares to Saturn in dogmatic Sagittarius. Fortunately, with so much mutable energy, it will be easier to shift out of the stuck places. In fact, the challenge of this lunar cycle may be to keep our attention focused but at the same time diffused. It will be helpful to adopt the expectation that something magical will happen if we let it. This is the time to plant a seed, a dream for the lunar cycle. With so much water and so much mutability in this chart, it is a good idea to invoke the blessings of flow, the melting of snow, the cleansing of water into your lunar dreams. Let some of your defenses down. Be guided by your own worthiness. Wednesday, March 9. When the Moon moves out of Pisces and into Aries today, we notice just a little less introversion and a little more desire to come out and join the world again. I wish for all of us that we emerge into this day feeling cleansed by the experience of supportive vulnerability. However, some of us may be feeling a little fragile from the events and memories that rose to the surface over the last couple of days. Aries’ gift is to begin again, to take a risk, to dare to make mistakes. May you receive that gift. Thursday, March 10. If you feel like you are the only who has dark thoughts of revenge, or isolating depression, or incredible frustration, then know you are not alone. I’ve noticed that when I am deep into my own experience, I can forget that I am not the only one having them. Today’s transits actually emphasize dark thoughts (Moon in Aries square to Pluto in Capricorn), sadness (Sun conjoined Chiron in Pisces), and extreme impatience (Moon conjoins Uranus in Aries). What happens when we feel empathy for how these emotions affect others too? Friday, March 11. While we slept (in the time zones of the western hemisphere), Mercury in Pisces conjoined Neptune. This is the perfect dreamtime transit. Perhaps you awaken with a vivid dream memory or perhaps you just feel attuned to seeing the world through Pisces glasses today. Intuition, synchronous messages, and poetry are the methods to use. Take extra care if you need to be linear, logical, or efficient with your words. This is a marvelous set up for a return to sensual delight when the Moon moves into Taurus. March 12—Crescent: Beginning. I’ve decided to work with this intention for the Pisces lunar cycle: to break down old myths through vulnerability and allow myself to be seen. This phase of the Moon is a time to take the next step, to begin to support intention with action. This phase is described as the “Breaking Free” phase of the cycle. To manifest something new, perhaps we need to break free of the old ways. The prime directive of this Pisces lunar cycle is to use the power of water to do things differently. Does this mean listening more to your emotions? Does it mean listening more to intuition? Can you create more flow and let the force of water help you around the obstacles in your life? Do you need to let water soften your hard edges or nourish dry landscapes? The possibilities of water are many. The Pisces crowd of planets just got larger. Venus enters Pisces today. This impacts the type of people we enjoy being around and how we want to interact with others. 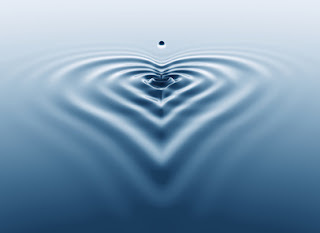 Wordless resonance is an important indication that you feel comfortable and attracted to others. The kernel of trust can help us break down barriers to vulnerability and wholehearted lives. We can be that person for someone else too. The Moon in Taurus supports other earth sign planets. Pluto in Capricorn and Jupiter in Virgo help us to build solid containers around floods of emotion, helping us to channel the power of water. Sunday, March 13. The Taurus Moon over the last couple of days has provided good grounding for Piscean explorations of water. When the Moon moves into another mutable sign, Gemini, this afternoon, it could feel like we’ve lost that stability. Gemini encourages conversation, connection ,and curiosity—all lovely qualities—but it can also encourage scattered thoughts and lack of focus. When you notice your mind spinning, remember the water of this lunar cycle. Water can calm and soothe overwhelming mental activity too.